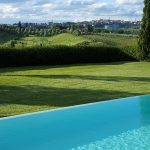 Our guests can enjoy the soothing infinity swimming pool filled with salt water, while overlooking the impressive views of the countryside and Siena. Breakfast is served in the garden or on the patio. Our guests are able to enjoy our small fitness area, equipped with a Turkish bath, treadmill, stair climbers, exercise bike and other exercise equipment. Two mountain bikes are available to enjoy excursions along the roads around the Crete Senesi. In each part of AiaMattonata smoking is forbidden, it’s possible to smoke in the garden. To assure the best relaxation for our guests, only children older than 12 years are welcome.